A spectacular trekking and climbing itinerary in Peru. 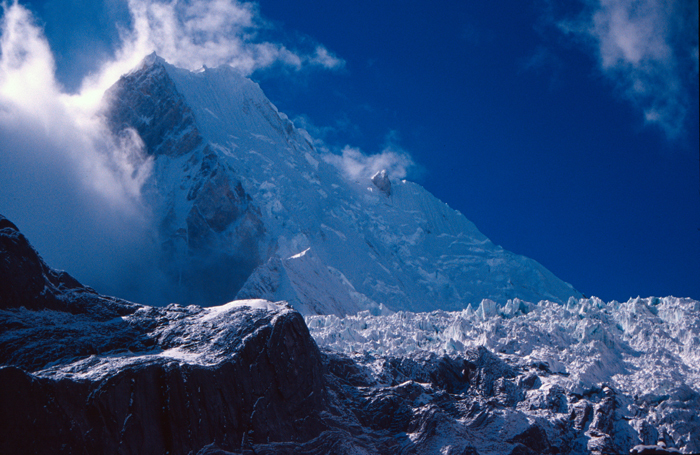 The circuit trek of the Cordillera Huayhuash is one of the world's great treks. For mountain scenery and remoteness it is without equal in the Andes. We have run this itinerary on five or six occasions since we first ran it back in 2004. It is an extended circuit compared with most companies, and including several spectacular climbing options. These include ascents of at least two 5000m peaks, Suerococha c.5400m and Leon Huacanan 5421m and a trip into the high glacier basin below the spectacular and immense south face of Yerupaja. The Huayhuash (pronounced Why-wash) circuit is a difficult and wild trek, crossing several high passes including one over 5000m high so a high level of fitness is recommended. This extended trek will be fully supported and take us a total of fifteen days, including a couple of rest days and the ascents of Suerococha and Leon. 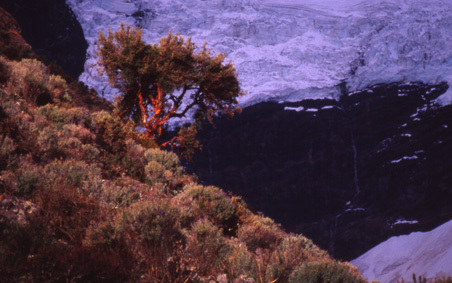 Previous experience of trekking and camping in remote areas is essential. This is a tough trek suitable only for those who are both fit and adventurous. 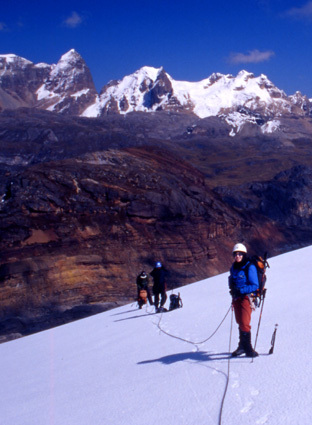 You will need to have or hire an ice-axe and crampons for the ascent of Suerococha and Leon Huacanan and for the trip onto the glacier beneath Yerupaja, but there is no need to have previous experience of using these prior to the expedition for these peaks. For those who wish to see more of the cultural side of Peru we can help organise a short tour of the famous city of Cuzco. For details and prices see our Cuzco and Machu Picchu extension page. The Cordillera Huayhuash are a compact mountain range situated about 200km north east of Lima. The range contains several peaks over 6000m high. The highest peak is Yerupaja, which at 6617m high is one of the highest peaks in the Andes and the third highest in Peru. The lower valleys that we will trek through have been glaciated in the past and many small lochs remain behind. We will often be camping by one of these picturesque lochs and the locals are known for catching fresh trout to sell to trekkers. The valleys contain large areas of pasture still used by the Quechua Indians who live in the mountains and we'll pass through a number of their remote villages on our way round the trek. The circuit of the Huayhuash is one of the world's greatest walks, offering ever changing views of the Cordillera Huayhuash, crossing high passes and beautiful high altitude meadows. The progress we make round the circuit will depend on several factors (weather, fitness, illness) but we give an outline description of the route divided into likely trekking days. The schedule indicated below gives us two spare days which we will use as rest days on the circuit. These can allow some time to recover while the fittest, or keenest, do an extra walk! The total distance is about 150km. Day 1 -- Drive from Huaraz and camp at Cuartelhuain at 4200m. Day 2 -- The pass of Cacanampunta (4700m) is crossed then we descend to Mitucocha 4200m. An easy day to start with. Day 3 -- Mitucocha to Carhuacocha. Another pass of 4650m takes us up and over to the large Laguna Carhaucocha. Day 4 -- Carhuacocha to Huayhuash. Over another pass to the settlement that gave the mountain range its name. Then over the Portachuelo Huayhuash pass at 4750m to the small shepherds settlements by the large Laguna Viconga. Day 5 -- Rest day at Laguna Viconga. Day 6 -- Ascent of Leon Huacanan for climbers, or rest day. Day 7 -- Lag. Viconga to Guanacpatay including crossing the highest pass of Punta Cuyoc, 5000m. Day 8 -- Guanacpatay to Huatia via Huayllapa village. In Huayallpa village you can buy beers and Coca-cola. Day 9 -- Huayllapa to Gasapampa via the Punta Tapush. Day 10 -- Suerococha ascent for climbers, or rest day. Day 11 -- Over the Punta Yaucha 4800m then down to the scenic Laguna Jahuacocha at the foot of the highest peaks. Day 12 -- Rest day at Jahuacocha, or local exploration. Day 13 -- Ascent to high camp at 4800m on the edge of the glacier beneath Yerupaja. Day 14 -- On the glacier below Yerupaja or time to explore the valleys and high altitude lagoons of the Jahuacocha area. Day 15 -- Laguna Jahuacocha to Llamac and back to Huaraz. Mist clearing over the spectacular south face of Yerupaja from the camp at the glacier edge. For those who wish to see more of the cultural side of Peru we can organise a short tour of the famous city of Cuzco, former capital of the Incas, and the spectacular ruins of the lost city of Machu Picchu. For more details and estimated costs see our Cuzco and Machu Picchu extension page. 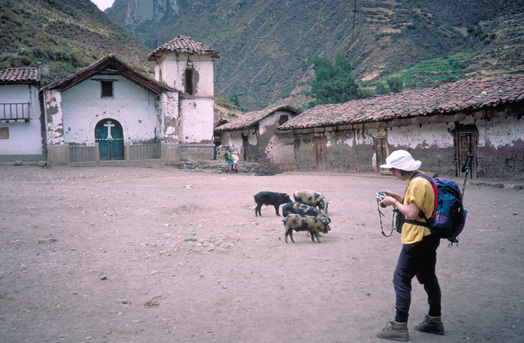 This time of year is the dry season in the Peruvian Andes and there are long periods of stable weather with fewer and less severe storms than the Alps have in a normal summer. There are occasional high winds and light snow flurries. Although the sun can be strong, temperatures at altitude can be extremely cold, going down to -5ºC during the 12 hours of darkness each night, so bring a warm sleeping bag and a good book! A typical village square in the Huayhuash. Customers should preferably be experienced hillwalkers or trekkers. No previous climbing or mountaineering experience is necessary for those taking the climbing options on Huacanan and Suerococha. Previous experience of wilderness camping is very very useful as these are extremely remote mountains. Cold nights, tired feet and some tinned and freeze-dried food are a few of the experiences which will have to be enjoyed. This trek is particularly arduous because we will be away from hot showers and comfortable beds for over two weeks. Customers should have a good level of fitness. Although the trek is fully supported we still have to cross many passes up to 5000m high in the mountains. We will be walking for about 6-7 hours per day, but you need to be able to continue at this pace for 4 or 5 days without a rest. Summit days for those taking the climbing options may be 8 hours or more and can be very tiring so a very good standard of fitness and stamina is needed. If you have any doubts about the suitability of these options for you then please give us a call. Almost every year we have someone drop out from this trek because they are not fit enough - make sure it isn't you. There are a number of interesting birds, animals and plants that we may see on our trek. A wild relative of the llama, the vicuña, is fairly common in some of the remoter areas of the Huayhuash. Also commonly seen are vizcachas, small rodents related to the chinchilla. Rarer animals include the Andean deer and fox. Amongst the birds we are likely to see are humming birds, torrent ducks, cara-cara, vultures and of course the Condor. Unusual plants we may well see include many species of wild lupins, the beautiful queñoa tree with its papery red bark and the giant puya, a plant related to the pineapple which produces the worlds biggest flower. All clients must be insured for medical costs and repatriation in an emergency. We recommend having insurance for baggage, personal liability and cancellation as well. If you'd like advice on insurance please ask. Vaccinations for tetanus, typhoid, polio and hepatitis are needed! Your doctor may also recommend rabies and diphtheria. Malaria and yellow fever precautions are not necessary as we won't visit mosquito infested areas. Peru suffers from a reputation for theft. It is important to stay alert when in busy public areas and to guard your belongings carefully at all times. Muggings and other violent crime are very rare. We will issue further advice to all clients before departure. This is an adventurous and remote trek and all clients will be exposed to an element of risk by taking part in this itinerary. While we take all reasonable precautions to reduce risk it is neither possible nor desirable to completely eliminate these additional risks. Some of these hazards carry the risk of serious injury or death. It is important that you understand the risks involved before signing our booking form. We have identified the following areas as the principal additional risks of this itinerary. This is not a fully inclusive list - please ask if you would like to see a more detailed risk assessment of this itinerary before booking. Driving, hotels and general safety : In Peru driving, fire safety standards and general safety standards are not as high as in Europe. Remoteness : You will be up to five days walk from professional medical help for periods of time. There is no chance of a helicopter rescue. Mountain Hazards : There are very slight risks from bad weather, and the usual mountain hazards including slight risks from rockfall, crevasse and avalanche hazard on the optional peak ascents. Our price does NOT INCLUDE - your flights, your insurance, your hotel/hostel accommodation, your meals taken at cafes and restaurants, your share of communal travel costs (e.g 4x4 rental, mule costs), your personal climbing and camping equipment (i.e. used by you alone, such as sleeping bag, ice-axe, crampons, harness, helmet), permits or peak fees payable by yourself. Our treks and expeditions are designed to be small and flexible. The trek will be co-ordinated, organised and lead by us, but will adapt to the plans and aspirations of the members. We will consult all members when planning the details of the expedition. Please note that the leaders decision is final where the safety of the group or a member is in jeopardy; for example retreat or diversion due to illness or bad weather. We run the Huayhuash as a fully supported trek; you'll only have to carry a lightweight daysack (camera, water and lunch, spare clothing). On the circuit trek we use donkeys or horses to carry all communal kit, food, camping and cooking equipment and a mess tent. We will use porters to help us reach the camp at the edge of the glacier under Yerupaja, but will have to carry our own packs back down. The minimum number of customers we need to run this trip is three. The maximum size of the trek will be six customers plus leader. 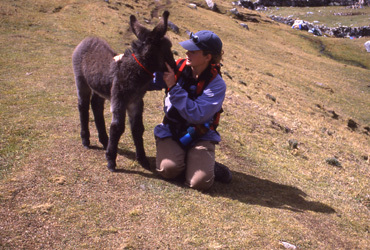 The Huayhuash trek is a hard, remote and committing high altitude trek with few easy options for leaving the mountains. It should not be underestimated. It is only suitable for very fit and experienced walkers.